Homepage. 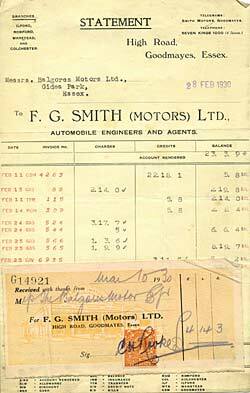 This page: A couple of interesting invoices from F.G. Smith Motors Limited, sent to Balgores Motors Ltd in Essex. F.G Smith - Automobile Engineers and Agents. October 1932 was issued by their South Street, Romford premises, whereas the other, earlier statement, was issued again to a garage located in Gidea Park, by the High Road, Goodmayes in Essex branch of F.G. Smith. The scan shown on the right is the earlier piece of ephemera, dated 28th February 1930. 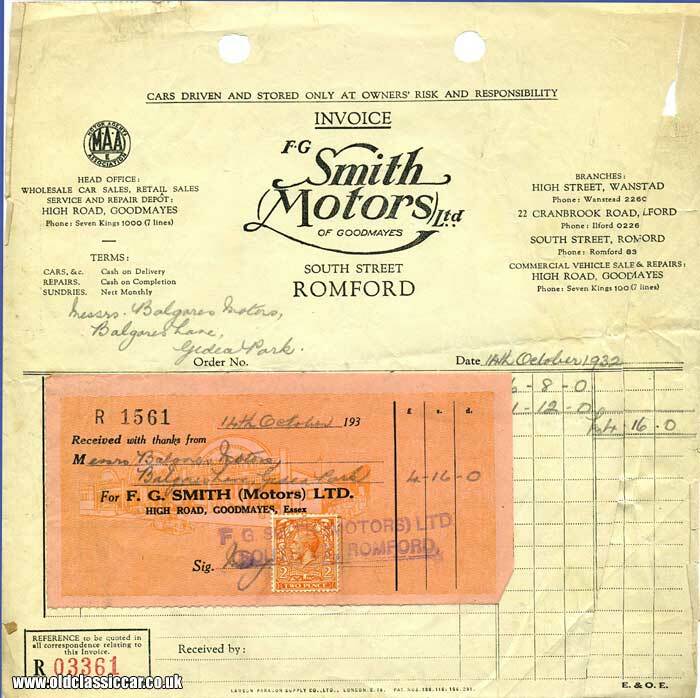 It shows a statement of account between F.G. Smith and a company called Balgores Motors Ltd, a motor agent and workshops that features in a number of the vintage invoices and billheads featured in this collectables section. This is printed on thin cardboard, and has a smart receipt from Smith Motors gummed to the front of it, along with a two pence postage stamp. At the top left is a list of all their branch locations - Ilford, Romford, Wanstead and Colchester. The second scan, shown below, is dated October 1932 and is an invoice issued by this garage to Balgores Motors, for the supply of two 28 x 5.25 India Covers (tyres), at £3.4.0 per tyre, less 25% discount. The header on this invoice is more ornate than that of the earlier statement already featured, also now including the logo of the M.A.A. - the Motor Agents Association. Again it has a receipt gummed on the front, the artwork featuring a different art deco style garage, both of which I've blown up and shown below for comparison. This first receipt shows an art-deco garage building, advertising "F.G. Smith Motors Ltd - Coachbuilders - Motor Engineers - Agents", with a smaller building to the right, announcing the company's "Repair Works". Various motorcar marques get a mention above the showroom windows, including Austin, Bean, Crossley, Overland, Morris and De Dion. The second receipt at first glance looks identical to the one above, but closer inspection shows a much larger deco building, possibly the head office that was located on the High Road, Goodmayes. The furthest curved frontage promotes "New Cars", the middle "Commercial Cars" and the nearest "Showrooms", below which it states "Morris Cars - Sales and Service".